The paper is a report on the study of Internet use and migrant workers in the Pearl River Delta (PRD). First, the paper illustrates that educational attainment is a significant factor in determining the type of Internet use that appeals to migrant workers. Second, it points out that both work-oriented and entertainment-oriented uses of the Internet have a positive influence on migrant workers’ jobs and social lives in the PRD. Access to work-related information improves their employment opportunities, while the various means of entertainment provide relaxation. The online chat and the virtual community provide migrant workers with emotional support and a strong sense of their local identity. The Internet café and online games allow migrant workers to relieve the pressures of work and passively challenge the power hierarchy in the modern factory regime. The paper concludes that the Internet use has become the integral part of the city lives of migrant workers in the PRD. DiMaggio, P., E. Hargittai, C. Celeste & S. Shafer. 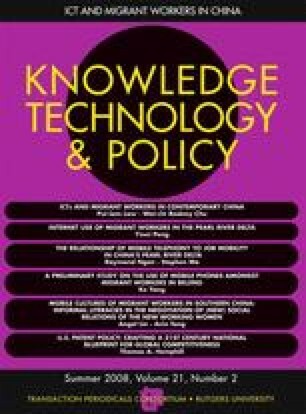 2003 From unequal access to differentiated use: A Literature review and agenda for research on digital inequality. Working paper #29, http://www.princeton.edu/~artspol/workpap29.html.